The Beehive, Vauxhall, provides the ideal environment for an impromptu or informal gathering or party. It's the place to meet friends or colleagues over a quiet drink. What's more is we are able to reserve an area of the bar especially for you. This ensures that your special occasion, whether it a work bash, a birthday, or any other kind of celebration - has atmosphere combined with an element of privacy. 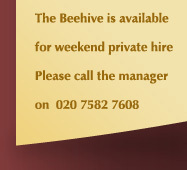 Whatever your party needs, The Beehive provides the surroundings to suit you.